Bloggers Invade Velocity Bar Marriott Hotel Manila! I have not been to a party like this in a while, and so it was a welcome diversion to go to Manila on a weekday for some good music, free food and drinks, games and great company - it was Bloggers' Night at the Velocity Bar, Marriott Hotel Manila. 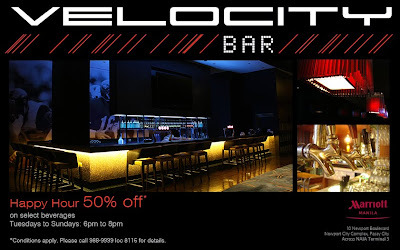 The moment you go through the doors of Velocity Bar, you will see why it is the Philippines' first and only 5-star sports and entertainment bar. The modern interior design perfectly reflects a chic and hip lifestyle - imagine yuppies with loosened neckties and young women in mini skirts. It is also a sports bar - with the bar’s multiple large LCD screens, this venue has already played host to Pacquiao fans several times over. Velocity Bar serves beer on tap, the beverage of choice for sports fans. 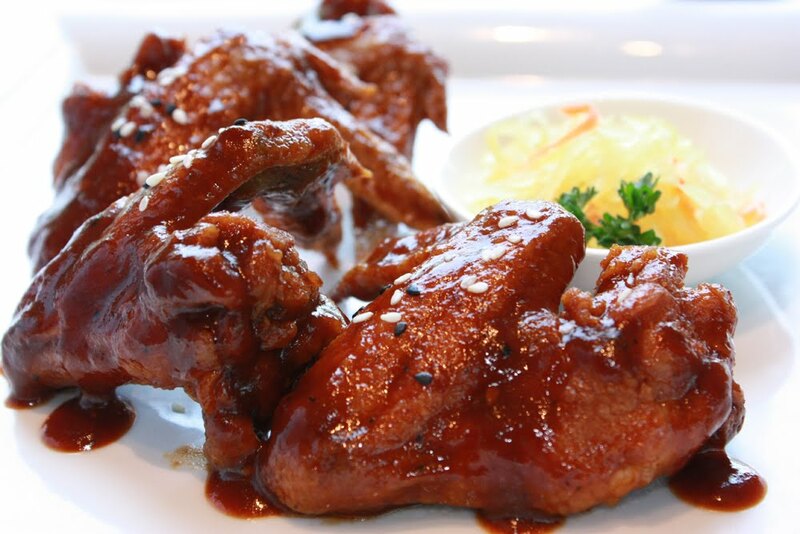 The food menu, on the other hand, includes grilled burger patties, chicken wings and squid rings in their lavish lineup. 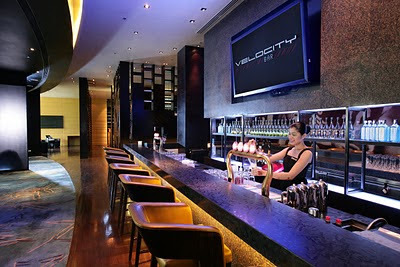 Velocity Sports Bar is housed inside the sprawling Marriott Hotel Manila, located across NAIA Terminal 3, a quick 15-minute drive from Makati or the Bonifacio Global City. 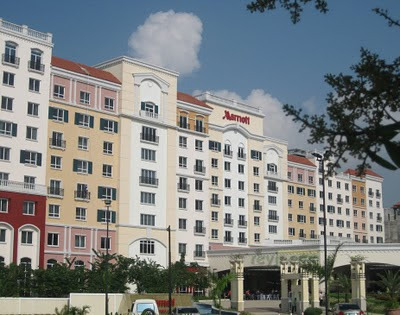 The hotel offers first-rate 342 room accommodations including luxurious bedding, high speed internet, 40-inch, high definition LCD televisions with a jack pack plug and play system (for all you techies) and spacious work areas. 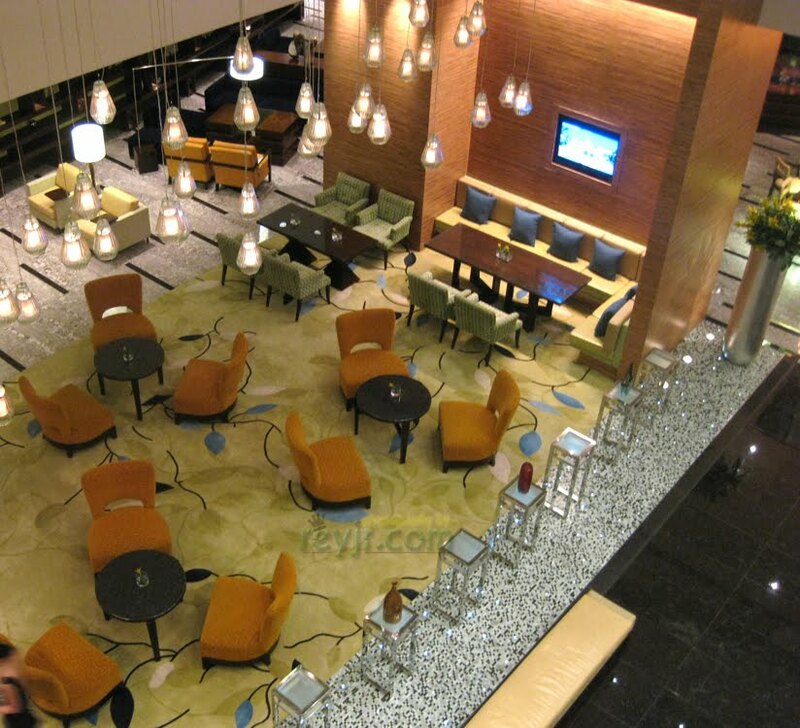 The two top floors house executive level rooms and 19 suites. 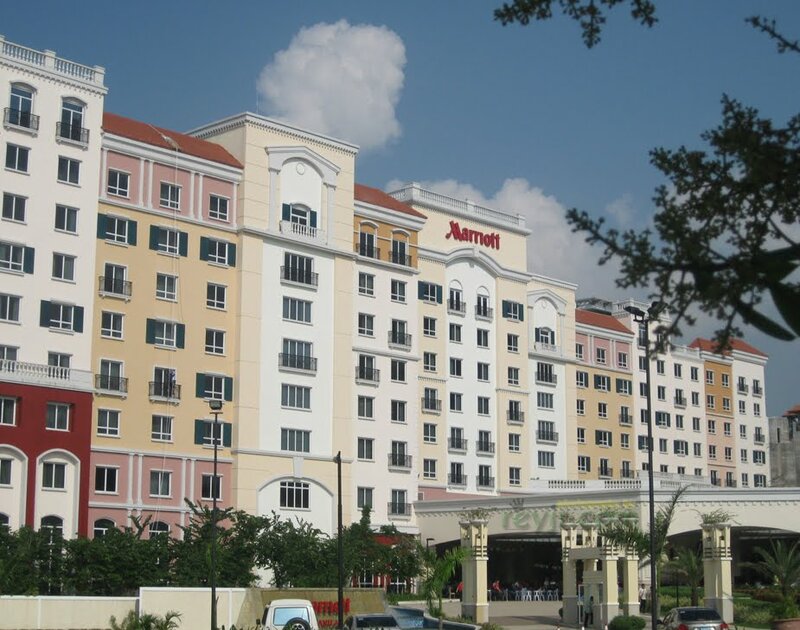 If you are a Golf enthusiast, Marriott Hotel Manila is right beside the 18-hole Villamor golf course. Dennis of Vignettes, whom all of us thought was the official photographer for the event, turns out he was a photoblogger! Erlyn, who incidentally also knew Liz's twin sister. She blogs at The E Zone. Emz the Frustrated Sosyalera, who was there with boyfriend John and Dr. Charma. Annalyn was also there with her hubby and baby in her tummy. After the program and the fun games, our hosts (including my girlfriend Liz, who actually works at Marriott) took us on a short tour of the other restaurants in the hotel - The Lounge, The Marriott Cafe, Java +, Cru Steakhouse, quite a variety of restaurants to choose from. We also passed by Marriott's signature spa, The Quan Spa, wishing they would be giving out our GCs for that too. Lol! Open from 1 pm to 1 am, the spa is ready to treat customers to scrubs, wraps, facials, of course, relaxing massages. Here we are showing off our Velocity Bar gift certificates. I have a feeling we will all be back at the Velocity Bar real soon. Haha! Want to visit Velocity Bar? Try the Happy Hour 50% Off!! Nice meeting you, Rey! That's me in the photo trying real hard to stabilize myself as I photograph. Hey Rey, is this the event that I missed? The one you were inviting us to come along? What's the white thing you guys were holding? Check? :) Chili wings are cool enough for me though. Yehessss, ikaw na ang Mr Congeniality! hehe! i'm already starving just looking at the chilli wings. whoah... I haven't posted mine yet! soon! Haha, oo nga Hannah. 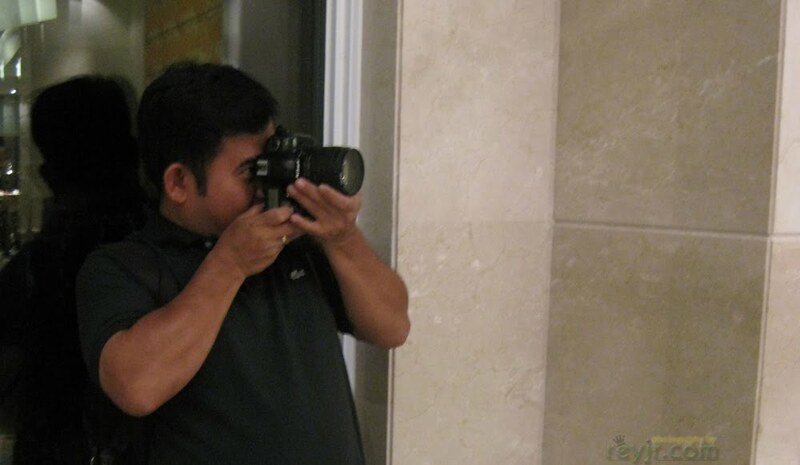 But I did see your photos of the event both from your and Vince's blogs. :) Galing! Abangan ko post mo about the Bloggers' Night at Velocity Bar then! Mukhang busy ka kasi dami events. hehe. heya! nice meeting you too, rey! Are you going to iBlog6 this Friday? Looks like this place is worth visiting. Hope I could visit there someday.